So another Friday Night or Saturday ritual of mine is taking my weekly bath. I shower several times during the week of course, but I take a warm and soapy bubble bath to wash away the frustrations of the week. I light scented candles, burn incense and make special smelling bath salts to put into the tub before I get in. Its actually pretty easy to make bath salt. Any salt works actually. I try to use a thick salt so it doesn’t desolve as quickly. I throw the salt into the water: about 2 tablespoons. Then I squeeze in some scented bubble bath and food coloring to change the color of the water. Next, I like to put in a few drops of essential oil. I have collected all kinds of this oil. Last night, I used bergamot and orange. Bergamot is an oily substance extracted from the rind of the fruit of the Seville (Spanish) orange tree. It is used in cosmetics and as flavoring in tea. My bathroom smells AMAZING after I get out and the smell lingers about the house. 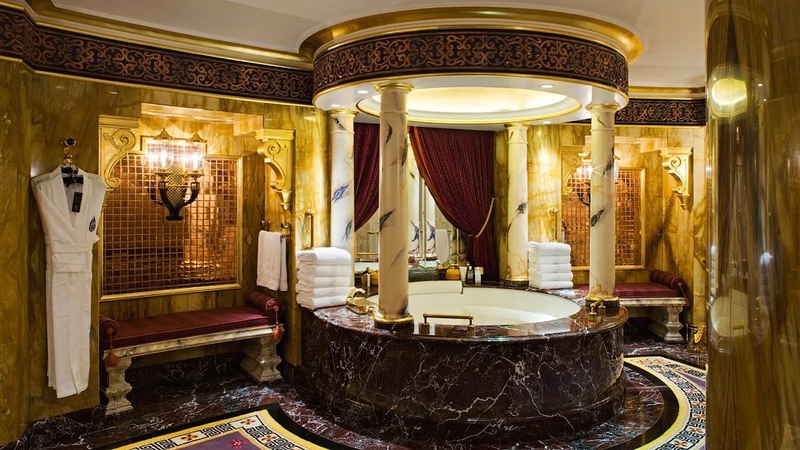 If I could bathe in our desert dream home, this could be our bathroom. After my bath, I get into a soft and plush robe and go on about my day/evening. Giving yourself the time to take a bath is just one example of something you can do for you. Self care is very important when you are stressed.